Bvlgari has two new fragrance releases at Sephora, Rose Essentielle and Voile de Jasmin. Both are floral interpretations of the original Bvlgari Femme fragrance. Rose Essentielle features notes of rose, blackberry, violet leaves, living mimosa, jasmin sambac, patchouli, and gaiacwood. Voile de Jasmin has living jasmine sambac, bergamot, orange blossom, rosewood, ylang ylang, living mimosa, and living rose. Both scents are available in 50 ml; Rose Essentielle is an Eau de Parfum, Voile de Jasmin is an Eau de Toilette. 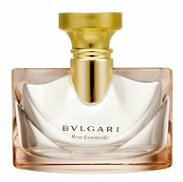 I wish Bvlgari fragrances didn't have that dreaded mass-market accord, because they sound so promising when you read about them! Living mimosa? As opposed to…? Living jasmine? Living rose? What's up with this new marketing spin? I may be wrong, but does it seem that guaiac wood is now making its way into many, many scents? I don't remember it being so popular until recently. L, I am not positive but I think these are variations of Bvlgari Pour Femme, which I know I have tried but cannot remember. Still holding out hopes for the Red Tea scent, I do love Omnia. A, I think, but am not positive, that it is marketing-speak for headspace technology or some other synthetic production process. It is appearing more and more often in fragrance notes. And agree on the guaiac wood. After I wrote that I flashed on the headspace angle. Which, of course, means the notes are totally synthetic, lol. Pod jasmine, pod mimosa, etc. Sorry, I envision a gorgeous, non-evolving scent with no soul. Which, of course, means I have to sniff this stuff to see if my hunch is right. LaureAnne mentioned the use of “mass-market” accord, and that makes me fear the worse — another clone scent. A, I can't do scent strips, I don't know why. They always smell bad to me, even if it turns out to be something I like on skin. And the new male version of I think it's Beyonce's perfume! I didn't pay much attention to the name, because it was such a one-note jolt, but it was a nice, leather-store jolt. It was like raw cut leather, not finished, like an old-time shoe store, or a Tandy store. Loved it. Wouldn't wear it, but loved it. It was so unique, it really stood out. I think it was in this month's Allure. I love Bvlgari, it seems to be one of the only mass market lines I enjoy. Everything from them has a definite tea note, which I so love. The Viole de Jasmin sounds absolutely amazing; I am going to rush out and try to find it. R, since discovering this site my spending has been through the roof…Mastercard and AmEx thank you I'm sure. At this rate I will earn the frequent flyer miles to make it to Paris and get my hands on SL TC. ps – Are these exclusive to Sephora? I really don't know, had never heard of them until I saw them on the Sephora site. But I doubt they are exclusives because it didn't say so. I've been a fan of some Bulgari fragrances, so I will definitely try these. Bulgari Pour Femme was my femme-fatale/low-cut-dress floral scent for a long time. It bloomed on a hot summer night. I think it boasted a tea note, too, although as a major tea drinker, I can't say I can even say I know what tea smells like when I smell it in perfume. Alas, the Pour Femme had something in it that sent my head throbbing, so I swapped it away. The Green Tea scent was wonderfully clean and wearable, too, without being trite. Anyway, I'm looking forward to smelling the new ones. Just wanted to note that I finally smelled these. Yes, the Rose Essentielle is a headspace rose, big and dewy and fresh, and utterly boring to me but someone will find it appealing, for sure. The Voile de Jasmin was a total surprise: warm, interesting, not too sweet, sheer, lovely. I might buy it. Once it shows up on Perfumebay, I mean. T, the coffret set is cute but too expensive for me at Sephora ($65 for 3 .34 oz bottles). Hope it makes its way to the discounters. I was really hoping to find a review of Rose Essentielle on this site. I tried it on paper, and found it very pleasant until a few hours later, when it started smelling a bit too sweet and powdery. I'd like to know what more people think. But after reading all these rave reviews about The Vert, I'm dying to try that (can't believe I haven't yet!). My only fear is that everyone in the world will be wearing it. The Green Tea is no longer a “unique” scent — not only do lots of people wear it, but there are also lots of very similar scents now from other brands. Perhaps we'll get to the Rose eventually — and you know they have a newer version, a lighter EdT? It came out this fall. I did, but I also heard the EDT was lighter than the original… as much as I like the original, I'm not sure I want anything sweeter than this. At some stages of the drydown, even this was pushing the sweetness level. Ah, I knew it was lighter, but not that it was sweeter. Haven't tried it yet. There is something in both the Rose Essentielle and Voile de Jasmin perfumes that I do not like on me after they dry down. I can’t describe it well, but they dry down to smell a little like ineffective-powder scented underarm deodorant after a long day of work? One of my friends wears the Rose Essentielle, and it smells lovely on her. It is so strange how two women can wear the same perfume but one of us will smell heavenly while the other smells like she had a long, hard day and needs a shower. I like the Pour Femme. That one smells good on both of us. Sounds like maybe something in the musk doesn’t work on you. Oh well, stick with Pour Femme!